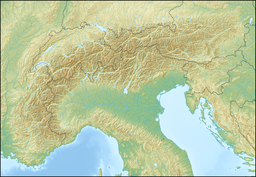 Mont Avril is a mountain of the Pennine Alps, located on the Swiss-Italian border. Its summit has an elevation of 3,347 metres above sea level and can be reached by a trail from the Fenêtre de Durand (2,800 m). Mont Avril is considered the smaller brother of Mont Gelé.